It’s hard to believe it’s already the first week in October. Especially when the weather here in West Chester is in the mid-80s this week! However, fall officially started last month, and as any Cincinnati resident knows, the weather can turn on a dime. So, with cold temps just around the corner, it’s a good time to think about making sure your home is ready for rain, mud, snow, and ice. Though, before anything else, remember to be safe. If you aren’t familiar or comfortable with any aspects of these projects, consider bringing in a pro or a knowledgeable friend. In the past, I talked about the importance of cleaning gutters and maintaining sump pumps as key to avoiding common water damage restoration emergencies. Considering that a hard rain can dump hundreds (or even thousands) of gallons of water onto your roof, you need your systems working to prevent flooding. If you aren’t familiar with your gutters, Lowe’s offers this basic tutorial. In the process of checking your gutters, also take a “peak” (see what I did there?) 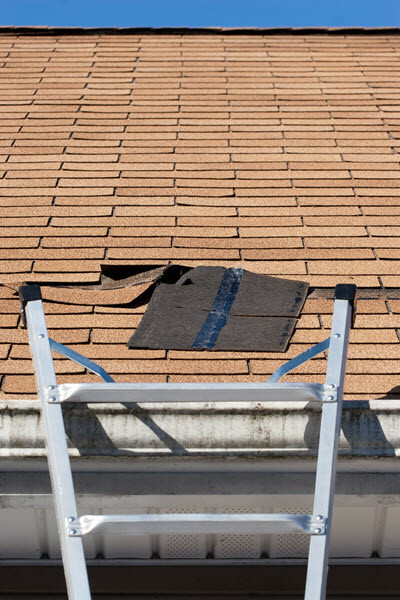 at your roof for loose or missing shingles. Many times, this can be done from the ground and a pair of binoculars are helpful. You might also want to wait for the next windy day to walk around your yard to check and see if any of the shingles are lifting in the wind. It is also a good time to check your roof for general signs of deterioration and common roof problems. If you are comfortable accessing your attic and can do it safely, check to make sure roof vents are unobstructed and your insulation is in place. Most homes are designed to have a “cold roof” which prevents ice dams. Insulation on the floor of the attic keeps heat inside your house and out of the attic. The vents provide air flow to remove any heat that does escape, so your roof stays close to the outdoor temperature. This is important as shingles are designed to shed water down toward the ground. If portions of your roof are allowed to warm up, it can melt snow that will then refreeze as it moves toward the lower edge. If this process is allowed to continue, it creates a “dam” that traps the water, allowing it to seep under your shingles, and into your home. Check caulk around windows and doors. Trust me, it’s much more pleasant to replace caulk on a nice fall day than dealing with it this winter. Now is also a good time to set up a calendar reminder to deal with outdoor faucets before the threat of the first frost. If you have an older home, you may have an inside shutoff and drain valve that allows you to clear water from the faucet and pipe inside your wall. However, it’s more likely you have a frost-proof sillcock that automatically drains water from the faucet and the short length of pipe entering your home. While these are generally reliable, they can fail if a hose or a quick connect coupling is left attached in freezing temperatures. The issue is that a hose or couple can prevent the faucet from draining as it is supposed to. Setting up a reminder now reduces the chances you will find yourself running around your yard in the early hours of the first day of a cold spell. Or, finding out you forgot because your basement is flooded! Moving inside, inspect the interior of your house for signs of existing water damage. Start on your top floor and check the ceiling for water stains. These are typically yellowish/tan areas with darker borders and is a sign that water penetrated the drywall. Other signs are drywall that appears bubbled, raised, or is soft to the touch. Be sure to have a flashlight and check the ceilings of closets. As I mentioned earlier this year, damp spots on your carpet can come from seemingly unlikely places, meaning that the water damage you see can be in a different area than where the water is entering. For example, I was once tracking down what appeared to be a leak in a basement. Water was pooling on the floor requiring the carpet and pad to be removed, as well as additional water damage restoration work. However, the cause wasn’t a leaking foundation. It turns out that the caulk on a second-floor window had failed. Water was entering around the window, flowing down the interior of the first-floor wall, and then pooling in the basement. While the basement required the majority of the restoration work, the solution to fix the cause was on the second floor. As you move into the basement, it may be more difficult to notice water damage on unfinished areas such as utility rooms. If you suspect water may have leaked down an unfinished wall but aren’t certain if that is still an active lead, one low-tech trick is to tape a small piece of paper towel or toilet paper to the wall. If water does leak, the paper will soak up the water, so you will either find it damp or be able to see it was wet and dried out. Overall, this should give you a chance of avoiding some common water damage issues. However, even with the best planning, Mother Nature still has a say. To be prepared for unavoidable water damage emergencies, we have prepared the printer-friendly guide to the right. 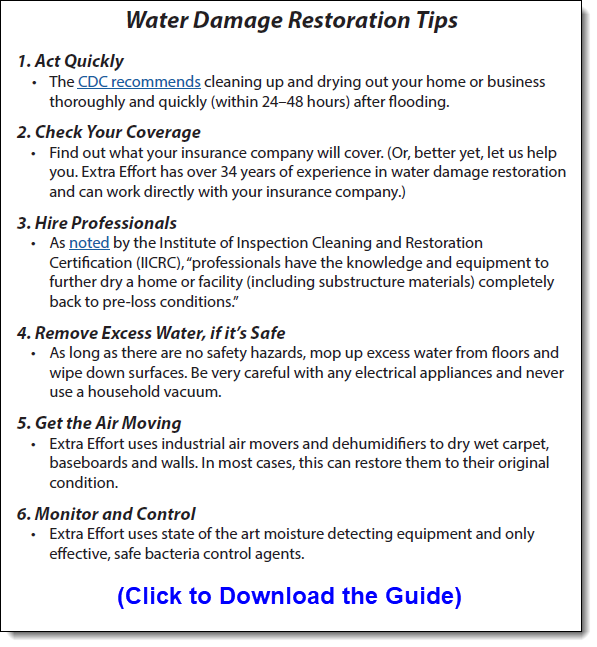 It covers the key steps for the water damage restoration process. And, if you need help, please call us. With more than 34 years of water damage restoration experience, you can trust Extra Effort to work with your insurance company to return your home or business to its original state.